He Knows The Power Of Style In Politics. Does the road to federal political success in Canada run through the pages of GQ? But Justin Trudeau certainly understands the value of the glossy magazine spread and Jagmeet Singh also knows precisely how style can provide a foundation for policy and political prose. And if you are a New Democrat intent on getting back into the ring after being dealt a knockout blow in 2015, you should probably take a moment from your search for the earnest party stalwart and take a look at the path being followed by Jagmeet Singh, who wants to usher in a new era for your bruised party. Style cannot be dismissed in politics, because, despite the iconic quote, it is not always show business for ugly people. It may come as something of a revelation, but there is a contest to lead the NDP underway and its top four contenders before Monday (May 15, 2017) night were federal caucus members Charlie Angus, Niki Ashton, Peter Julian and Guy Caron. All bring strengths to the table, particularly Angus, with his tireless and effective work on indigenous issues that have so far received more lip service than action from the Trudeau Liberals. But none of them are going to burn their brand into Canadian sensibilities or set hearts aflutter. Jagmeet Singh gives Canadians outside the party a reason to look in the NDP window to see what is on offer. 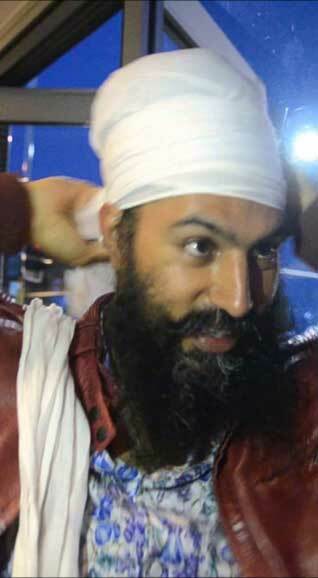 If nothing else, the trilingual Jagmeet Singh will inject some colour into a decidedly vanilla race, bringing some bright orange energy to a beige entity puttering along in the slow lane. His decision on one front -- though long rumoured -- requires a certain audacity, given his youth (38), his lack of federal experience and national profile. He could have taken a safer path, biding his time to await the fate of provincial leader Andrea Horwath should the Ontario NDP leader fall short one more time next year. That could still be his fate because he is not surrendering his provincial seat, but Jagmeet doesn’t seem like a guy to bide his time. If you wait until “your time,’’ that time may never come and Jagmeet may have calculated perfectly. This may be his time. He was able to put more people in one room for his kickoff than the other four leading candidates combined. It was a younger crowd, it was the most diverse crowd at an NDP event I have ever seen in almost three decades of enduring such evenings and, in keeping with the man they came to see, it was a stylish gathering. Party insiders will tell you this guy has done the work needed for this bid. Those just returned from the British Columbia wars laud his work for the party in the key ridings of the Surrey and Richmond area. He has reached out to the governing caucus of Alberta Premier Rachel Notley and has ties to the Manitoba NDP. But he will clearly face a challenge in Quebec, no matter how many times he refers to the party’s 2011 Orange Wave breakthrough in the province. Organized labour is in a wait-and-see mode. He will likely need someone to help him navigate the federal scene, his own Gerry Butts, who shepherded Trudeau from the third place valley to the mountain of power. His slogan “With Love and Courage,’’ was vaguely reminiscent of Layton’s iconic “Hope is Better than Fear” message delivered before his death and Jagmeet is receiving help from some veterans of the Layton days, a few of whom were in the room. Outgoing leader Tom Mulcair’s name was never mentioned Monday. It was as if his era never happened. In that February interview with GQ, Jagmeet said his well-cut suits and colourful turbans allowed him to have conversations with Canadian voters. “Fashion and style is a form of communication,’’ he said. New Democrats are about to find out whether this a guy in an empty, well-tailored suit, or a man of heft in bespoke threads. Many seem prepared to bet on the latter.